Grab your slippers and cardigans because you are officially invited to our annual community breakfast entitled Won’t You Be My Neighbor? The breakfast takes place on Thursday, March 7th. This annual event is always a celebration of the many communities that come together in the Commons, and this year’s program will focus especially on our connections as neighbors that unite and strengthen us collectively. Highlights of the event include a fast-moving live auction, music from the Milner Family Fiddles, and the presentation of the Friends of the Community Award. A tasty breakfast is served courtesy of Honey Bear Bakery. The breakfast is the largest fundraiser of the year for Third Place Commons and the funds raised at this annual event empower the Commons to host over 900 free events annually including the Lake Forest Park Farmers Market from May to October each year. Funds also help support the Market Bucks food assistance program for low-income community members, enabling them to access nutritious, farm-fresh foods during market season. 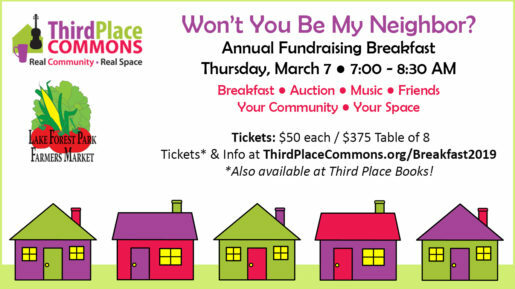 Third Place Commons is a community-supported 501(c)3 nonprofit organization dedicated to fostering real community in real space, and this is your chance to show your support for this vital community. Visit the event page to learn more or get your tickets now for the big event! Next Post: An Invitation: Celebrate Anne Stadler with Us!